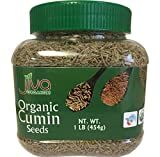 What are cumin seeds? About the ingredient cumin seeds. Including 505 recipes with cumin seeds, nutrition data, photos, and where to find it. Cumin can be found in some Dutch cheeses such as Leyden cheese, and in some traditional breads from France. It is commonly used in traditional Brazilian cuisine. 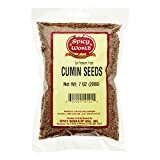 Cumin can be an ingredient in chili powder (often Texan or Mexican-style), and is found in achiote blends, adobos, sofrito, garam masala, curry powder, and bahaarat. Cumin can be used ground or as whole seeds. Cumin was also used heavily in ancient Roman cuisine. It helps to add an earthy and warming feeling to cooking, making it a staple in certain stews and soups, as well as curries and chilli. Although cumin seeds contain a relatively large percentage amount of iron, extremely large quantities of cumin would need to be consumed for it to serve as a significant dietary source. Ridiculously good quality certified USDA organic whole cumin seeds High Purity, Intense Aroma, and Great taste NO salt, NO MSG, NO GMO, NO Ethylene Oxide (ETO) treatment, NON-Irradiated All Natural, No Artificial Colors, Flavors or Preservatives Value Sized 1 Pound Jar! Cumin seeds are usually found in the spices section or aisle of the grocery store or supermarket. Cumin seeds are a member of the Spices and Herbs USDA nutritional food group. How much do cumin seeds weigh? There are 513 recipes that contain this ingredient.